Robert "Bob" Odenkirk is an American actor, comedian, writer, director and producer. He is best known as the co-creator and co-star of the HBO sketch comedy series Mr. Show with Bob and David. In the 1980s and 1990s, he worked as a writer for such notable shows as Saturday Night Live, Get A Life, The Ben Stiller Show, and The Dennis Miller Show. In the mid-1990s, Odenkirk and David Cross created the Emmy-winning sketch comedy program Mr. Show, which ran for four seasons and ultimately became a cult success. In the early 2000s, Odenkirk discovered Tim Heidecker and Eric Wareheim, and helped the pair create and produce the television series Tom Goes to the Mayor and Tim and Eric Awesome Show, Great Job!. To date, he has directed three films: 2003's Melvin Goes to Dinner, 2006's Let's Go to Prison, and 2007's The Brothers Solomon. Odenkirk appears in the role of Saul Goodman in AMC's Breaking Bad. Odenkirk was born in Berwyn, Illinois, and was raised in nearby Naperville. He is the son of Barbara and Walter Odenkirk, who was employed in the printing business. His brother is comedy writer Bill Odenkirk. Odenkirk is of half Irish descent. His parents later divorced, and Walter eventually died from cancer and was "pretty down on his luck" towards the end of his life. His father's battle with alcoholism would later influence Bob's decision to avoid alcohol almost completely. Odenkirk would later say that he grew up "hating" Naperville because "it felt like a dead end, like Nowheresville. I couldn’t wait to move into a city and be around people who were doing exciting things." Odenkirk has said his strongest comedic influence was Monty Python's Flying Circus, primarily due to its combination of cerebral and simple humor. His other influences included SCTV, Steve Martin's Let's Get Small, Woody Allen, The Credibility Gap, and Bob and Ray. He also visited Chicago's Second City Theater at the age of 14. He began his foray into comedy writing as a radio DJ for WIDB, his local college station at Southern Illinois University Carbondale. He worked at WIDB with newsman Greg Weindorf and traffic man Matt "The Agitator" Helser now of Dirty Laundry Podcast fame. After 3 years of college, Odenkirk decided to try writing and improv in the Chicago comedy scene. First studying with the famous improv-guru Del Close Odenkirk also attended "The Players Workshop of the Second City" where he met Robert Smigel and they began a collaboration that would last for years and take Bob to Saturday Night Live. Odenkirk was hired as a writer at Saturday Night Live in 1987 and worked there through 1991. Working alongside Robert Smigel and Conan O'Brien, he contributed to many sketches they created, but felt uncertain of his own writing and not very effective at the show. He acted in several small roles on the show, most visibly during a 1991 parody commercial for Bad Idea Jeans. In Odenkirk's final year at SNL, he worked alongside Adam Sandler, David Spade, Chris Rock, and Chris Farley, but his desire to perform caused him to leave the show. Odenkirk has credited SNL with teaching him many lessons about sketch writing, from senior writers like James Downey and Al Franken, as well as his friends Smigel and O'Brien. When Saturday Night Live took its 1988 summer break, Odenkirk returned to Chicago to perform a stage show with Smigel and O'Brien, titled Happy Happy Good Show. The following summer he did a one-man show, Show-Acting Guy, directed by Tom Gianas. During his final summer hiatus, he wrote and acted in the Second City Mainstage show, Flag Burning Permitted in Lobby Only. In that particular show, he wrote the character "Matt Foley, Motivational Speaker", for Chris Farley, which would later be reprised on SNL. In 1991, Odenkirk was hired to write for the TV show Get a Life, which starred Late Night With David Letterman alumnus Chris Elliott. Other notable writers on the show included Adam Resnick and Charlie Kaufman. The show was short-lived, and in 1992, Odenkirk briefly wrote for The Dennis Miller Show. Odenkirk's friendship with Ben Stiller, whom he shared an office with briefly at SNL, would lead to him being hired for the cast of The Ben Stiller Show in 1992. Working as both a writer and actor on the show, he created and starred in the memorable sketch "Manson Lassie", and helped the show win an Emmy Award for writing. However, the show had already been canceled by the time it won the award. Odenkirk also met David Cross at Ben Stiller; shortly afterward, the pair began performing live sketch shows, which eventually evolved into Mr. Show with Bob and David. In 1993, Odenkirk began a recurring role on The Larry Sanders Show as Larry Sanders' agent, Steve Grant. He would sporadically continue the character through 1998. Also in 1993, Odenkirk had brief acting roles on Roseanne and Tom Arnold's The Jackie Thomas Show. Created by Odenkirk and David Cross, Mr. Show ran on HBO for 4 seasons, over 33 episodes. The show featured a number of comedians in the early stages of their careers, including Sarah Silverman, Paul F. Tompkins, Jack Black, Tom Kenny, Mary Lynn Rajskub, Brian Posehn and Scott Aukerman. While nominated for multiple Emmy awards in writing and generally well liked by critics, it never broke out of a "cult" audience into larger mainstream acceptance. After Mr. Show, Bob and David and the writers from the staff wrote the movie Run, Ronnie, Run. The film was an extension of a sketch from the first season of the show. However, the studio took production control away from Cross and Odenkirk during the editing stages, and the pair has disowned the final product. Since Mr. Show, Bob has acted in numerous television shows and some films. He has written and produced many TV pilots, including The Big Wide World of Carl Laemke and David's Situation, but none have made it to air or been picked up as a series. In 2004, Bob received an unsolicited package including the work of Tim Heidecker and Eric Wareheim. Inspired by their unique voice, he connected with them and helped them develop a semi-animated show for Adult Swim called Tom Goes to the Mayor. Bob also assisted Tim and Eric with the development of their second series, Tim and Eric Awesome Show, Great Job. 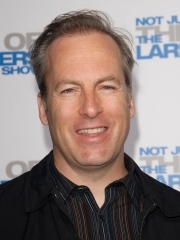 Odenkirk has had a number of small featuring roles on TV shows, including Dr. Katz, Professional Therapist, Seinfeld, NewsRadio, Just Shoot Me!, Curb Your Enthusiasm, Arrested Development, Entourage, Weeds, and How I Met Your Mother. He also appeared in Everybody Loves Raymond as Scott Preeman. In 2009, Odenkirk joined the cast of AMC's Breaking Bad as the corrupt lawyer Saul Goodman. He appeared as a guest star in three episodes of the second season, and became a series regular in the third season. In 2003, Odenkirk directed Melvin Goes to Dinner, which won the Audience Award at the SXSW Film and Music Festival. It was later self-released in five cities, then distributed on DVD by Sundance. In 2006, Odenkirk directed Let's Go to Prison, written by Tom Lennon and Ben Garant of The State and Reno 911 fame. Let's Go To Prison starred Will Arnett of Arrested Development, as well as Dax Shepard and Chi McBride. In 2007, Odenkirk directed The Brothers Solomon, written by Will Forte. The film starred Forte, Will Arnett and Lee Majors. Odenkirk is married to Naomi, and the couple have two children. Whole or part of the information contained in this card come from the Wikipedia article "Bob Odenkirk", licensed under CC-BY-SA full list of contributors here.